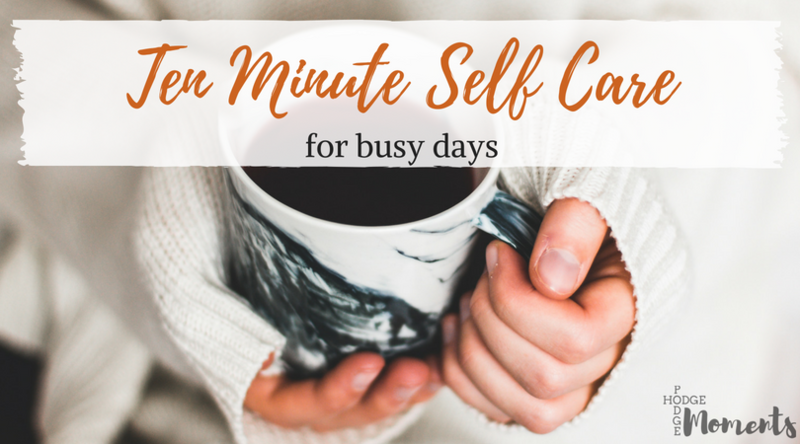 Self care can be a challenge, especially on a busy day when you can barely find ten minutes of downtime. It doesn’t have to be a challenge though. 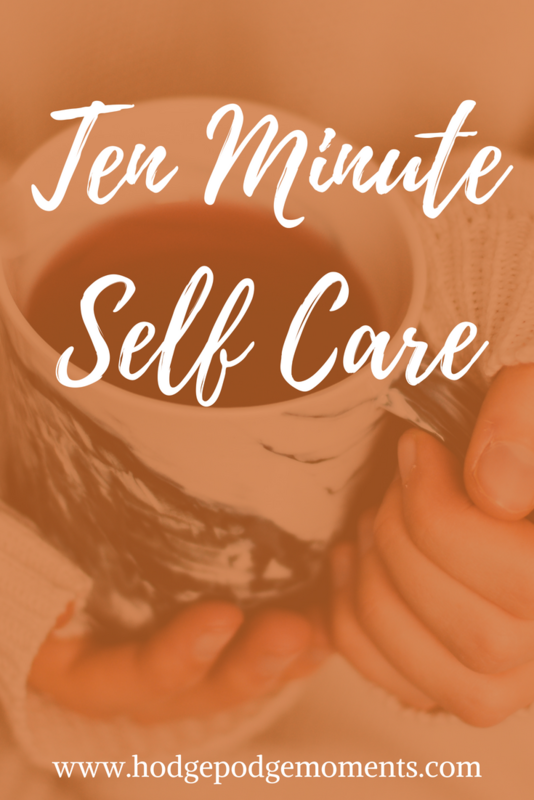 There are lots of self care activities you can do in ten minutes or less. Today, I’m bringing you just a few simple ideas to use the next time you find yourself with a few minutes to dedicate to yourself. Sometimes my only form of self care is during my shower. I have to wash my body or else someone might comment on the stink. Sometimes, I make my shower extra special with a face mask, sugar scrub or hair mask. Each of these leave me feeling a bit more pampered without adding any extra time. I love making coffee or tea in the morning. In many ways, it feels like a small, simple treat for myself. For some, this may just be a part of the day, but for others, it’s their favorite part of the day. Take a few extra moments in the morning to find your thing that makes it special. It may be what’s in your cup or it could be music on the radio. Sometimes all it takes to feel special is your favorite food or drink. Taking some time to enjoy a favorite food or drink can do wonders for your mood, making it the perfect form of self care. (As long as it’s not overused on junk food…) I mean, a girl’s gotta eat, right? You might already be treating yourself to self care every day without even realizing it. Do you take time to watch a favorite show or to read a book? These are easy forms of self care that are often overlooked – especially the shows. With that being said, a book or magazine can be the perfect fit when you only have a few minutes of free time. There are several ways to treat yourself at night. You could indulge in a glass of wine or a cup of tea before heading to bed. Another simple thing to do is pick out a favorite blend for your essential oil diffuser (this one is my favorite). You could even go to bed just ten minutes early to give yourself a little extra shut eye. The possibilities really are endless when you have ten minutes to spare. Self care doesn’t have to be long or complicated. It can be the simple, little things that we do during our day to day lives. If it brings a smile to your face, then it probably qualifies as a form of self care. On those busy days, try to combine two tasks to get in a little extra self care for yourself. A favorite drink can be enjoyed while you work on something else. Essential oils can fill the air while you’re cleaning the house or doing another necessary, but undesirable task. Keep it simple and try to make life enjoyable whenever you can – that’s the true secret to self care when you’re busy beyond belief. How do you incorporate self care in your day to day life? I would love to hear some of your favorites in the comments below! I love to take care of myself with a good cup of tea, a book and a hot bath! That sounds like the perfect combination to me! Love your ideas. Definitely, some that I will take and implement myself. Thank you. Love these! Taking a few minutes to read a book or magazine is one of my favorites! I love taking time to read! It’s something I need to do just a bit more often actually. I’ve been focusing on this more lately. As I get more into Holistic Health and the balance of mind body and soul it really is important to our overall wellbeing to just take joy in the little things. It’s so important to our overall being. I notice when I don’t give myself enough attention, then it comes out in my actions towards others. Fantastic simple tips! I am always glad to learn ways to incorporate self care into my daily routine. So important as a busy mom! It really is! I feel like it’s more important as a busy mom and much harder to do. Quite the challenge sometimes. I find that I’m the other way! I have an easier time relaxing at night and a harder time in the morning. I think it’s because I automatically jump into “what needs done” mode in the morning. the funny thing about self care when you have wee children, is that there does come a day when one does have time to do a bit more…. but can’t remember what to do! I can believe it! When our little one started sleeping through the night, I had a few nights of “what do I do with myself.” It’s interesting how we adjust to the busyness that comes with little ones.